How do I unlock Prisoner stage 4? The world of Fortnite is in mortal peril. The evil Ice King and his frosty undead followers are threatening the entire arena in your favourite battle royale game, and only one hero can put a stop to them. Yes, and you can only do it by unlocking Fortnite Prisoner stage 4. Or you’ll just look a hell of a lot better doing it. Regardless, in case you’re not in the know when it comes to the game’s coolest new mascot, the Prisoner is a Fortnite skin that’s unlockable after you have completed 60 of your normal weekly challenges. However, the skin evolves in multiple stages but, unlike your normal quests, the game doesn’t tell you how to restore him to his full, fiery glory, so we’re going to tell you how to unlock Fortnite Prisoner stage 4. This maxed out version of this grizzled skin sees almost all of his shackles removed, he looks somewhere between Kratos and League of Legends champion, Brand. Plus, mountainous map changes following patch 7.4 are fuelling rumours of a volcano eruption ahead of the Fortnite season 8 release date. Anyway, let’s get to it, here’s how to unlock the Prisoner stage 4 in Fortnite. To unlock the Prisoner’s final form, you must travel to a mountain north of Wailing Woods and east of The Block. The circular scorch mark can be found at the centre of this hill. Unlike stage 3, you just need to land inside the circle of pots. This see our hero fully free of his chains and even more fiery, as if channeling the power of a volcano. As a side note, make sure you’ve caught up on your first batch of Overtime challenges, such as the quest to find seven ammo boxes at a Fortnite motel or RV park. 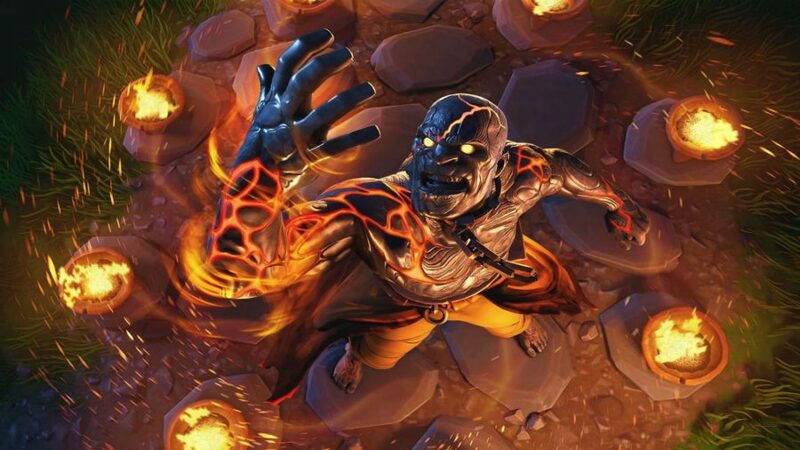 The week 11 loading screen – pictured at the top of this page thanks to a leak from @lucas7yoshi – shows the fully upgraded skin in all its glory surrounding by a circle of fire pits. Remember that when you attempt to unlock the last stage you’ll need to have the Prisoner skin equipped. There’s even some speculation that there will be a Fortnite Prisoner stage 5 skin. The reason being that each new stage has removed some of the Prisoner’s locks, and after the stage 4 skin there still appears to be a lock around his waist. For now, make sure you’ve completed as many weekly challenges as possible and got through as many Battle Pass tiers as you can. Reaching sufficient tiers is a requirement for completion of the new Overtime challenges and, if you complete enough of those, you get a free Battle Pass for season 8. You can’t argue with that – it’s almost as if there’s another game that’s just come out that might be a bit of a threat, or something.